GREAT VALLEY - William Minard Roosa III, 76, of Hungry Hollow Road, went home to be with God on Friday (August 13, 2010), following a long illness. Mr. Roosa spent his last day at home with his loving and devoted family. Born September 7, 1933, in the French Hospital in New York City, he was the son of William Minard Roosa II and Anna Elizabeth O'Donnell. Mr. Roosa resided in Queens Village, Queens, throughout his formative years. At the ripe, young age of 10, William (Bill), was a music enthusiast. His passion began in 1943 after attending a musical production featuring a symphony orchestra at The Radio City Music Hall in Manhattan with his parents. He became mesmerized by the trumpet section, which soon became his passion and remained so for the rest of his life. Bills earliest training began under the direction of a lead Broadway trumpeter. In his early teens, Bill studied with classical trumpet players from the New York and Boston Symphony Orchestras. In l951, Bill joined the United States Marine Corp. He was selected to play in the President's own, United States Marine Band, on Parris Island, South Carolina. His military band was comprised of world-renowned musicians from around the nation who were drafted into the Corp. Bill's company was asked to perform at the Orange Bowl on New Years Day in l952. Shortly there after, he was asked to play his trumpet in a show starring Eddie Arnold, an honor Bill was most proud of. Bill's next assignment was with the 2nd Marine Air Wing Band at Cherry Point, North Carolina. Bill soon became a respected and requested soloist, conducting with the likes of Doc Sverenson, conductor of the Buffalo Philharmonic Pops Orchestra. In l953, Bill was sent to The Navel School of Music in Washington, DC. 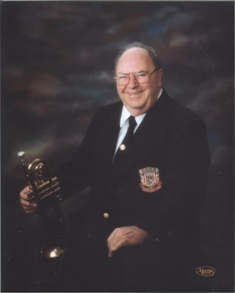 After finishing his service with the Marine Corp., Mr. Roosa spent many years performing and touring with musical groups in and around New York State, including St. Bonaventure University, where he began taking courses. Bill played with the Stan Kenton Band, and he formed the Salamanca Civil War Band, and Tower Musicians Band of Western New York, who performed at the Smithsonian Institution, and on The Mall in Washington, DC. He was instrumental in coordinating the Smithsonian Institutes Music Archives pertaining to the Civil War. In September of l968, at age 35, Bill attended SUNY Fredonia, School of Music, at the urging of the Brass Faculty, after his Civil War Band performed there. While in attendance, he continued to perform all across New York State. He toured with The Wind Ensemble, The Symphonic Band, the Symphony Orchestra, The Faculty Brass Quintet and the Opera Orchestra. Bill later joined the Fredonia Jazz band, and performed at the Mobile Jazz Competition in Mobile, Alabama in l970 and l971, winning the national title. Mr. Roosa obtained both his Bachelor's and Master's Degrees from SUNY Fredonia. Bill became the Allegany High School Music Teacher in l971, where he taught until l987. He produced the first high school band to ever create and record an album. A number of his students were members of the McDonald's All-American High School Band. Throughout his career, Bill also taught at St. Bonaventure University and The University of Pittsburgh at Bradford. He was a member of the world famous "Windjammers", serving as president for three years, and was an active member of the Franciscan Honorary Prayer Group. Surviving are his wife Norma (Dolitsky) Roosa of Great Valley, Brother John (Grace) Roosa of Deer Park, Long Island, sons, William Roosa of Salamanca and ex-wife Angela Chen of Bronx, New York, Joseph (Rita) Roosa of Allegany, Jerrold (Karen) Roosa of Randolph, ten grandchildren, and several nieces and nephews. Friends may call on Monday (August 16, 2010), from 2 to 4 and 7 to 9 p.m. at the O'Rourke & O'Rourke Funeral Home, 25 River Street, Salamanca, New York. A Mass of Christian Burial will be held on Tuesday (August 17, 2010) at 11:00 a.m. in St. Mary of the Angels Church, Olean. Father Greg Dobson, pastor, will be the celebrant. Online condolences may be sent to john@orourke-orourke.com.